China's disease control authorities will continue supporting the Xinjiang Uygur autonomous region to keep the region polio-free, a senior official has said. Wang Yu, who heads the Chinese Center for Disease Control and Prevention, made the promise at a media event on Tuesday in Beijing to mark Xinjiang's continued polio-free status, which was confirmed by the World Health Organization at the end of last month. Last year, there was an outbreak of polio in Xinjiang that entered the region from abroad. The 21 cases detected between August and October 2011 resulted in one death, and 17 people, including eight children, were paralyzed, according to the Ministry of Health. Polio, or poliomyelitis, is a virus that infects the brain and spinal cord, mostly in children younger than 5 years old. One in every 200 cases leads to paralysis, usually of the legs. "We've learned a lesson and will expand routine vaccinations in the area to avert future outbreaks," Wang said. He said previous Chinese CDC studies showed that only 60 to 70 percent of Xinjiang residents had been vaccinated against polio, but 85 percent should be vaccinated to ward off an outbreak. "In some areas the rate could be as low as 50 percent," he said. In response, "the central government has allocated 160 million yuan ($25.7 million) to improve local public health services", Wang said. Vaccination agencies will all be equipped with appliances to store vaccines at the necessary low temperatures, he said. A suspected-case reporting system will be established at local hospitals to detect possible infections as soon as possible, he added. In addition, border surveillance will be beefed up to prevent polio from entering China from abroad, he said. According to Luo Huiming, deputy director of the National Immunization Program under the Chinese CDC, the outbreak last year was the first to come from abroad since 2000. Because Xinjiang borders Pakistan and Afghanistan, where polio is endemic, "it's still at risk of infections, which know no boundaries", Luo said. "We have to ensure comprehensive polio vaccination in the area to protect people from the disease," he said, adding that greater efforts should be made to raise vaccination awareness, particularly among ethnic groups. "Thanks to assistance from the WHO and UNICEF, we launched a massive polio vaccination program in Xinjiang and regained the polio-free status within a short time," he said. 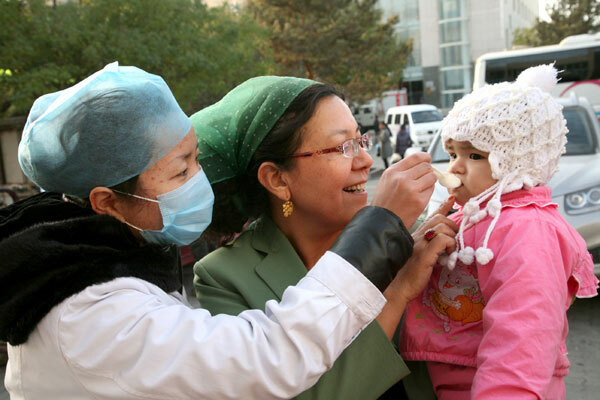 Five large-scale vaccination campaigns have been carried out in Xinjiang between September 2011 and April 2012, and at least 43 million doses of polio vaccine were given to children and adults. According to the WHO, Chinese governments at all levels spent more than 340 million yuan for the response effort. Michael O'Leary, the WHO representative in China, said that the 2011 polio outbreak showed that no place was safe until the crippling and lethal infection is eradicated worldwide. With vaccination being the only means of prevention, it's crucial to strive for and maintain high immunization coverage, he added. Luo Huiming agreed and recalled some difficulties during the massive vaccination campaigns. Some local people refused at first to get vaccinated because of ethnic traditions, he said. "Some even confused vaccination with family planning — the two sound similar in Chinese," he said. "But with great patience we informed them of the importance of vaccination, and most finally said yes," he said, adding that the vaccination programs were free and voluntary. A 33-year-old Uygur resident of Kashgar, Xinjiang, who gave his name as Parhat, was vaccinated during the campaigns. "People younger than 40 in southern Xinjiang were advised to get the polio vaccine, so I did. I took the 'sugar pill' vaccine twice for free at the community center since last September," he said. "Before taking the vaccine, I read and signed the notice about possible side effects after taking the pill. I had a fever after taking the vaccine, but the day after I was fine," he said.